Pts. of Louisiana, Ark., Miss., Ala., Florida. 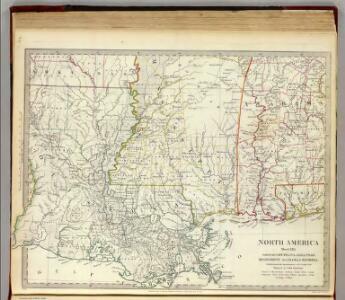 Map of Louisiana, Mississippi and Alabama. Map of Louisiana Mississippi And Alabama. A Map of the State of Louisiana. 1 : 2000000 Tanner, Henry S.
1 : 2400000 Lucas, Fielding Jr.
(Louisiana) Railroad Map of the United States. from Carey's general atlas, improved and enlarged : being a collection of maps of the world and quarters, their principal empires, kingdoms, &c.
1 : 1788000 Hammond, C.S. 1 : 1900000 Schonberg & Co.
1 : 1970000 Lucas, Fielding Jr.
Panorama of the Seat of War. Bird's-eye View of Louisiana, Mississippi, Alabama and part of Florida. Drawn from nature by J. Bachmann. Panorama of the Seat of War. Bird's-eye View of Louisiana, Mississippi, Alabama and part of Florida. Drawn from nature by J. Bachmann. This 1861 map presents a ‘Bird’s Eye View’ of the Gulf region around Louisiana, Mississippi, Alabama and the edge of Florida. Drawn and published by John Bachmann, the map details numerous strategic forts around this region, including Forts Pickens, Phillip and Jackson, as well as the city of New Orleans. The map highlights how important water routes and control of coastal defences were by both sides during the conflict. 1 : 1140480 Tanner, Henry S.
1 : 1100000 Tanner, Henry S.
1 : 1110000 Tanner, Henry S.
States Of Mississippi And Louisiana.